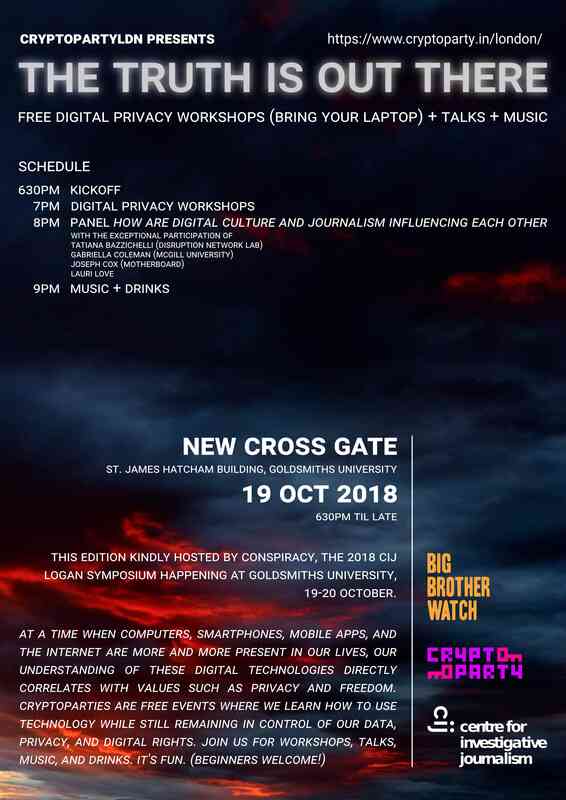 Next @CryptoPartyLDN will be on Friday 19th October 2018 in parallel with the Centre for Investigative Journalism Logan Symposium entitled Conspiracy (@cijlogan) hosted by Goldsmiths, University of London. Free! All welcome! Friday 19th October 2018 7.00 pm - 10.30 pm Goldsmiths, University of London 8 Lewisham Way, New Cross, London SE14 6NW No registration for @CryptoPartyLDN. Free entry. 7.15 pm : Workshop time! @SpyBlog First Contact Problem First Contact Problem - Under what threat models can journalists and activists protect their anonymous sources / contacts and vice versa ? How can their communications and meetings be kept private ? Also the regular Anonymity SwapShop - bring along spare social media accounts, SIM Cards, burner phones, Oyster Travel Cards etc. to swap or barter with other people, to help break the financial and CCTV purchase trails.